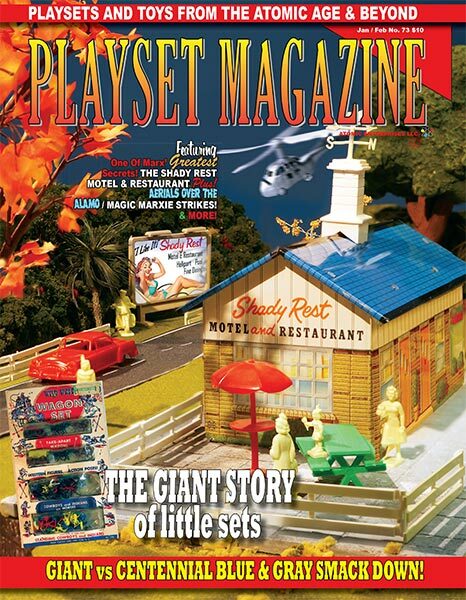 Keeping with our quirky January themed issues, this time we host a big story on the little giant toymaker, The Giant Story. 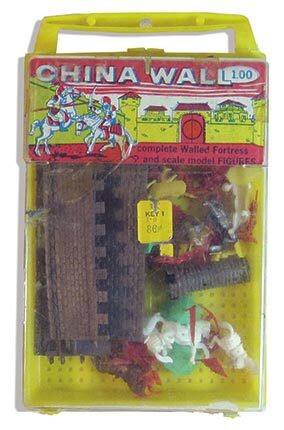 This is one of Kent Sprecher's gem-like tales of well-known but less reported toy makes, helped so much by Mark Hegeman’s photos and depth of collection that we’re concluding the story next issue to show figure groups and accessories. This time you'll get the complete story of the maker and a grand look at some of their finest sets. Also here is a story on the littles Zorro, and "Aerials Over The Alamo" -- a magnificent birds-eye view of the village of San Antonia ("La Villita") and that mission turned fortress by Costan Spina. Just when we thought it would be smooth sailing with a merely tidy informative issue, Bill Berghorn called. He found a little building and wanted to know if we could tell him about, and oh boy -- he’d caught a live one. The Shady Rest Motel and Restaurant has finally surfaced. It was big news, coupled with Bob Jones’ discovery of the unimpeachable source of one of the great Marx mysteries ever. Put the two together and that makes this issue “giant” in its own right, but wait! Our Giant Blue & Gray VS Centennial Set coverage is also here, thanks to Rick Eber.We call it theCentennial Blue & Gray VS Giant Blue & Gray SmackDown, featuring all the epic differences that make those two legendary sets great and different -- and which one is best if you could only have one? ! Full house folks, the giants are all on board. Thanks for being here; you make America’s vintage plastics publication all the better for it. Happy New Year folks, thank you for being here!